The Sensormatic Synergy 2.5 Self-Contained Pedestal provides superior Sensormatic AM EAS anti-theft protection with up to 2.5m (8.2ft) of coverage between pedestals. The on-board electronics are mounted in the primary pedestal, eliminating the need for an external controller. The integrated audio and visual alarms notify store personnel if protected merchandise passes through the detection zone. The multiple audio and visual alarms can be customized for different event types, mapping the audio and ambient lighting options to reflect the source of the alert such as foil-lined bags and jammer devices. 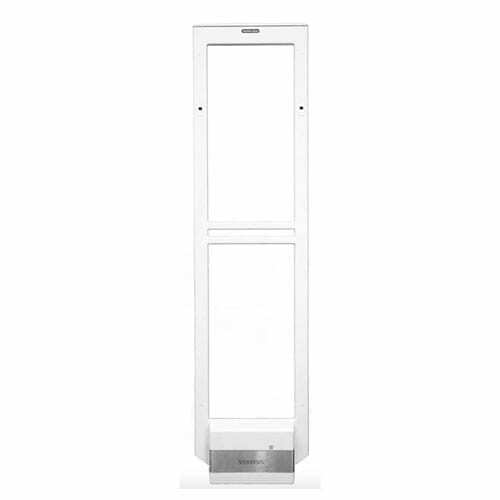 The pedestal features embedded, multiple-beam people-counting sensors designed for optimal accuracy. With the Synergy network card, these sensors enable Traffic Intelligence reports that provide visibility into shopper traffic to enhance store performance and increase leverages valuable pedestal real estate at the store entrance to reach a large number of shoppers on-the-move. The easy-to-install poster helps draw shoppers into the retail environment with advertisements, modern designs or simple, low-cost printed graphics. This add-on also provides an opportunity to generate additional marketing co-op profit by bidding out this valuable advertising space to vendors. Consistent 2.5m (8.2ft) global detection performance protects critical assets. Embedded people-counting sensors provide Traffic Intelligence and directionality to calculate conversion rates and maximize store performance. Optional Metal-Foil Detection alerts staff when foil-lined bags or clothing enter the store environment, helping combat shrink and ORC. Optional network plug-in card delivers store-front alarm event and Traffic Intelligence to enhance loss prevention efforts and increase shopper visibility. “Tags-too-close” feature helps reduce unnecessary and costly service calls and maximizes valuable selling floor space near the pedestals. Integrating directional traffic information with EAS alarm events allows the sensors to discern between inbound and outbound traffic, virtually eliminating unintended alarms triggered by shoppers carrying protected merchandise near the pedestals. Jammer Detection helps reduce shrink by notifying staff of attempts to disable the EAS system using a separate audible alarm. Customizable alarm tones and LED alarm light identify unique events to help reduce shrink. Service connection port allows full system software control at any antenna, helping reduce in-store service time.